The month of November has not been too kind for the Aardvarks, who posted a 2-5-2 record over the month. A combination of a tough schedule and the lack of proper conditioning by a few of the veteran Aardvarks during the off-season is the direct link to starting the season three games under 0.500. Some highlights over the month include Jayde Barkman’s 81 save performance agianst the Rifles on November 13th and Donny Buchko’s four goal night against the Brewsers on November 28th. At the well-oiled age of 76, Buchko continues to rewrite the history books of the IRHL. Due to Aardvark’s goalie Jayde Barkman’s unquenchable interest in nursery rhymes and his passion for vowels of the English language, he developed a keen interest in farming upon hearing ‘Old MacDonald Had a Farm’. EIEIO. 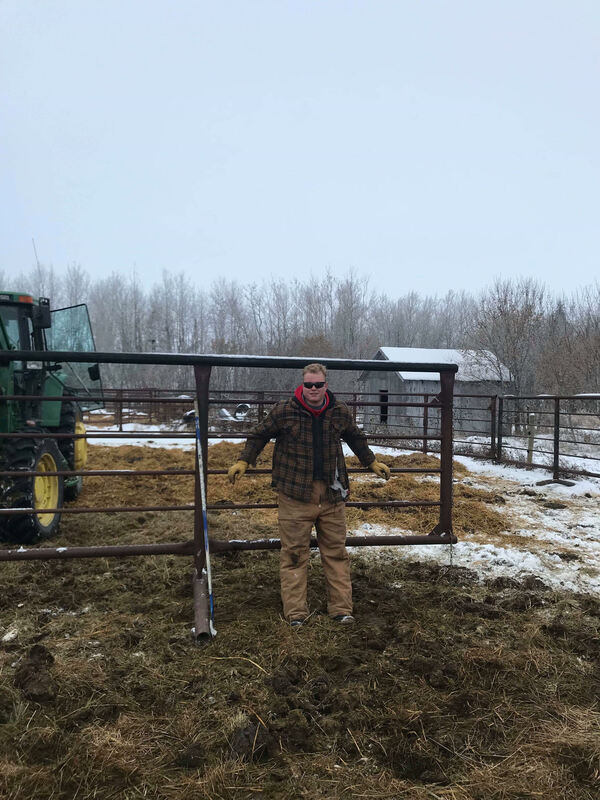 Barkman striking a pose while closing the gate to his heifers. Aardvark’s Nation believes that none of the Aardvark’s three netminders resemble Hockey Hall of Famer Martin Brodeur.